A long track record of dividend increases doesn't automatically make a stock a great investment. A long history of rising dividend payments is one indicator of a quality company. Dividend Aristocrats are a select group of companies that have managed to increase their dividends for at least 25 consecutive years. These companies often have considerable competitive advantages, and investors are typically willing to pay a premium for the stocks. Every Dividend Aristocrat isn't a great investment, though. Paying too high of a price for even the best company can lead to disaster in the long run. We asked three of our Foolish contributors to discuss a Dividend Aristocrat to steer clear of in July. Here's what they had to say. Tim Green: In the world of spices, McCormick (NYSE:MKC) is king. The company is the largest player, by far, and investors have rewarded McCormick's dominance with a lofty valuation. The stock trades for about 34 times last year's earnings, despite the fact that operating income has barely grown at all since 2011. 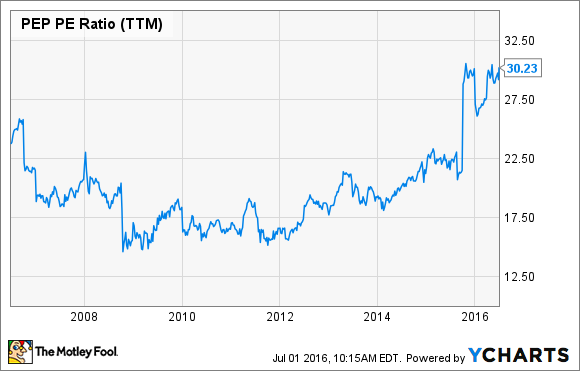 And while McCormick has paid a dividend for 92 years in a row, the yield is a paltry 1.6%. McCormick stock has more than doubled over the past five years, but this run has pushed the price up so high that it's difficult to imagine a scenario where buying McCormick today leads to market-beating returns. 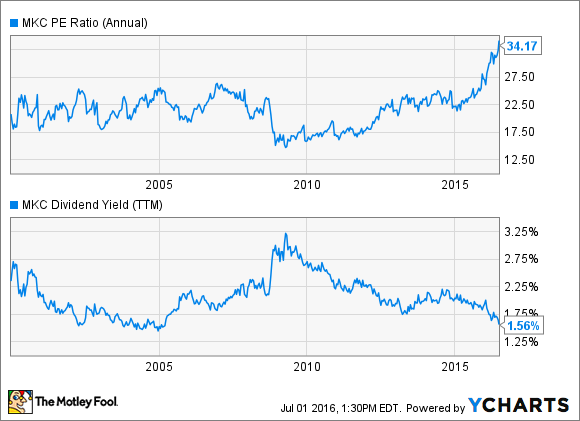 The PE ratio is at its highest level since the 1990s, and the dividend yield is at its lowest point since 2005. MKC PE Ratio (Annual) data by YCharts. With close to a century of consecutive dividend payments and a pretty substantial economic moat, McCormick may seem like a safe bet. But the extremely high price means that McCormick stock is far riskier than many investors assume. Great companies deserve to trade at a premium, but in the case of McCormick, that premium has gotten out of hand. Brian Feroldi: It's no secret that Americans are shifting their eating habits toward healthier options, which is a huge challenge for companies that profit by selling soda. According to Beverage Digest, soda consumption in the U.S. is now at a 30-year low, and total volume has declined for 11 years straight. I'm a firm believer that the trend is likely to continue for years to come, which is a serious challenge for big soda makers like Pepsi (NASDAQ:PEP) to overcome. Of course, the company isn't just sitting still. Pepsi has been investing heavily to develop "guilt-free" products for years, and the push is starting to pay off. About 45% of total revenue comes from products that fit into this category, and carbonated beverage sales now only constitute 25% of the top line. If the company is successfully adjusting to changing consumer habits, why would I suggest that investors avoid this Dividend Aristocrat's stock right now? One word: valuation. Market jitters and historically low interest rates have caused investors to flee to quality companies like Pepsi, which has pushed the company's PE ratio to a 10-year high. PEP PE Ratio (TTM) data by YCharts. Pepsi is currently trading for more than 30 times trailing earnings. That's a high price to pay for a company that's racing to adapt to shifting consumer tastes. For that reason, I'd suggest that investors avoid this stock for the time being, and instead focus on buying dividend payers with a more reasonable valuation. Neha Chamaria: A stock offering an attractive dividend yield may not be the best choice for income investors if the dividend isn't growing much. Consider food products distributor Sysco (NYSE:SYY), for instance. Forty-five years of dividend increases, and a current dividend yield of 2.5% appear tempting, but Sysco has raised its quarterly dividend by only $0.01 once a year in each of the past six years. Put another way, Sysco's dividend has grown at a compounded average rate of only about 3.8% during the period. What worries me is that, on a per-share basis, Sysco paid out nearly 75% of its free cash flow, and more than 100% of what it earned, in dividends last year. That leaves little room for growth in dividends. As it is, Sysco's tiny low-single-digit operating and net margins leave much to be desired. Then there's Brexit. Just last month, Sysco received the European Commission's go-ahead for its $3.1 billion deal to acquire Brakes Group. Based in Europe, Brakes Group has extensive operations in the U.K., which could give Sysco huge headway in both markets. But the deal suddenly appears to be ill-timed, thanks to the looming uncertainty in Europe and the U.K. after the shocking Brexit vote. Of course, Sysco may back out, but it'll have to rethink its growth plans, which would present a challenge. Oh, and did I mention that Sysco is trading at nearly 36 times trailing earnings and 17 times cash flow? That isn't cheap, and you can find a better Dividend Aristocrat in which to park your money right now.